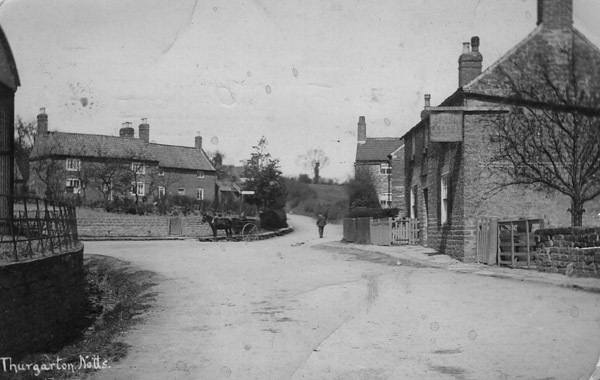 The main road through Thurgarton (the A612) is nowadays a busy highway and pedestrians attempting to cross can grow old waiting for a gap in the traffic. 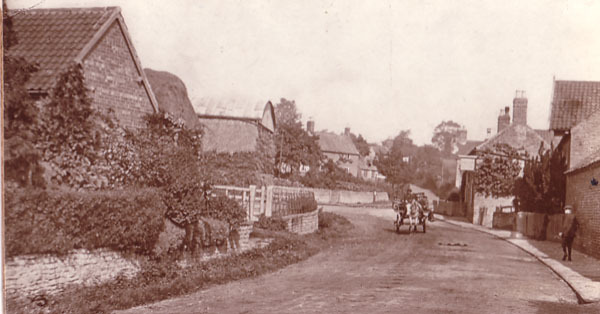 The photographs and postcards below take us back to late Victorian and Edwardian Thurgarton. – and a farm lad could take his time driving a cow down the highway. – but going up Thurgarton Hill, which was much steeper in those days, one had to pace oneself. — and if one had over refreshed and suffered a breakdown then simply roll back down to the smithy at the crossroads. 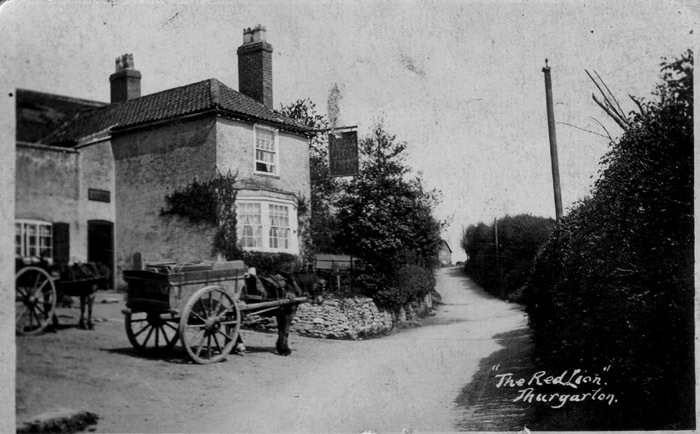 We live at the top of the hill in the photo of the Red Lion-former home of Daisy Stanton,the district nurse and some of the Bentley family.We bought the cottages from Trinity College Cambridge in 1985.I remember collecting the key from the Atkins sisters who lived next door at Hill Top Cottage-Kath would sweep the road (!) and Lily would bake apple pies.Their cottage always smelled of baking and had lovely cosy fires burning.Lily and Kath would tend their allotment gardens behind the cottages.Percy Warriner (Lily’s boyfriend! )would visit from his cottage on Beck Street-he used to tell me that although she cooked for him everyday he hadn’t decided whether to marry Lily yet-he was in his 90′S! Percy was a friend of Albert and his brother who lived on Beck Street in the Victorian brick cottages that look like ours.Albert grew his veg and sold them by the side of the beck and I remember he also always sold wonderful brightly coloured dahlias. 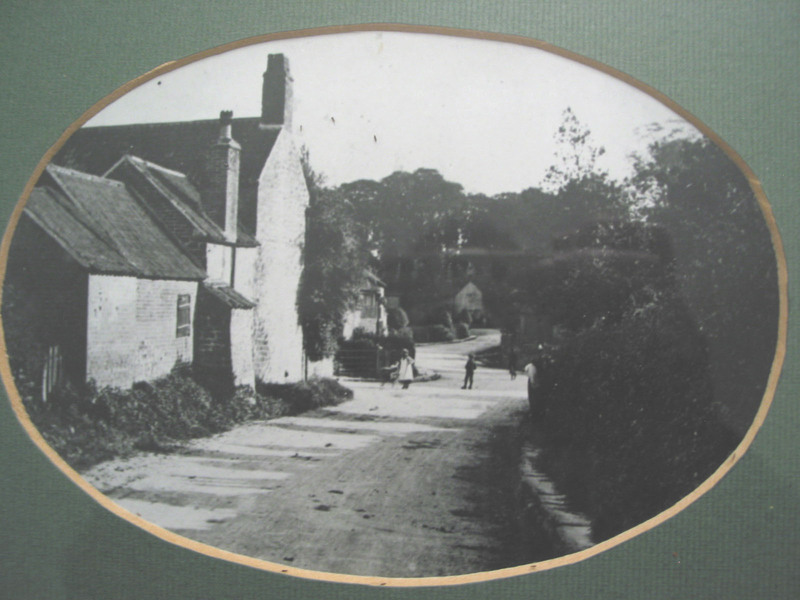 The Hydes lived next door to us-Charles was an eminent architect and designed Overfield for his wife Pauline having acquired the land as a payment for a job. The North’s lived opposite-Frank was the registrar. Their son still lives in the village.Evacuees lived in the white cottage in WW2-I have an account-I met one chap a couple of years ago when he was visiting the village to show his wife where he stayed in the war.He was telling his grandson about the blacksmiths (now the beauty parlour). He told me about playing at the Priory and pushing the invalid son around in a wicker chair.The post lady still lives in the village-one of the Atkins sisters was also the post lady!The White House was apparently some sort of hospital-we still dig up medicine bottles! 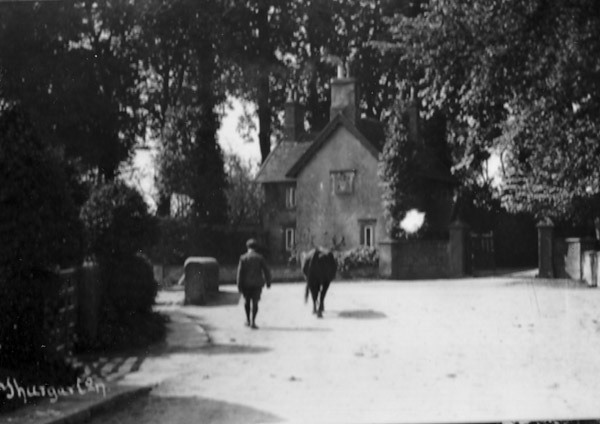 Copsehill was the Police House.The Beauty Parlour was the village shop.So we had a blacksmith/wheelwrights, 2 pubs, a village shop, tea parties at the old rectory,a priory,a research centre for Boots, a district nurse, a methodist chapel, a church, a school, a hospital,allotments a cricket ground….